Living on the south coast, what could be more appropriate than boats, which is the next Scribble Picnic challenge. As I happen to be working on a series of textile seascapes at the moment, there are three small boats in this piece which I hope counts. 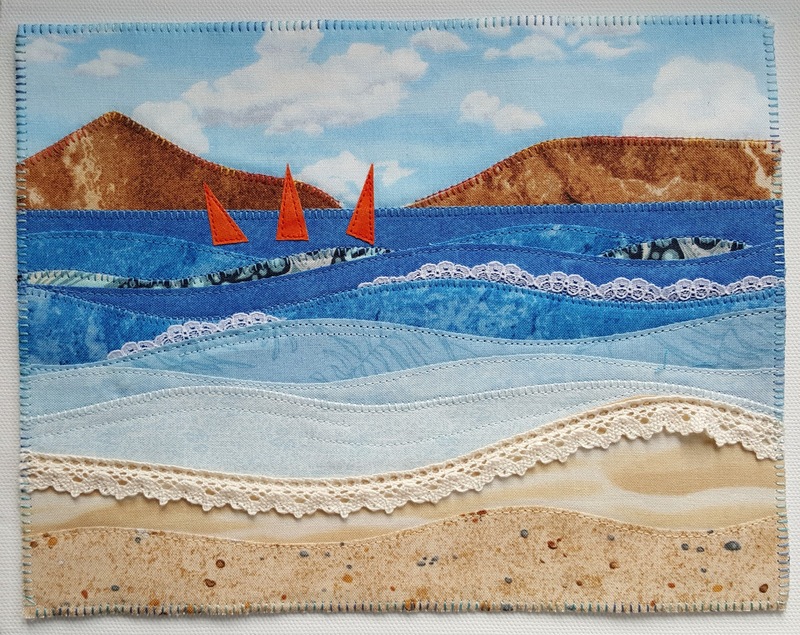 This is a work in progress piece of textile art and still needs embellishing to give more depth to the sand and surf. 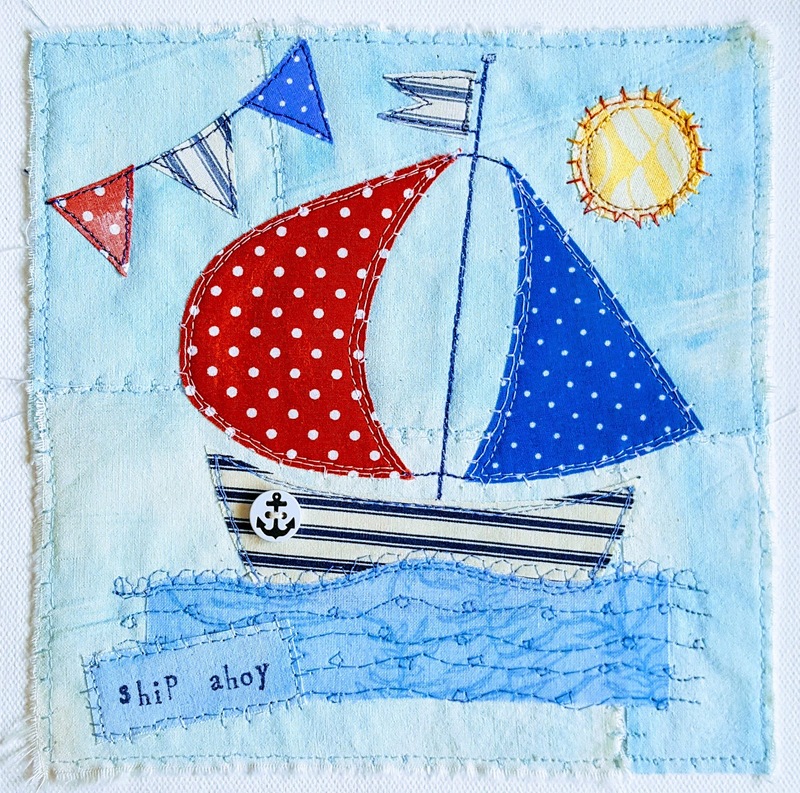 If not then I do have a jolly fabric boat which I did recently, again all fabric. Boats galore on our host Michael's page. Your pieces are so precious Linda thanks for sharing! 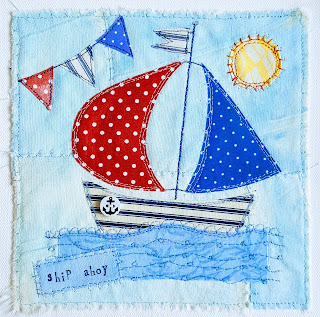 Oh how I love polka-dot sails......sail away with me! Such beautiful appliqué Linda - both pieces are so pretty. I used to do some of that many years ago, your work is definitely stirring my sleeping creative juices! Love the ocean waves - and tag - in the second piece. What's the approx. size of this piece please? Mary, the second piece is 8x8 inches. Hope is does inspire you. Oh Linda. I absolutely love these! You have "painted" with fabric and they are gorgeous. Thank you for sharing these. these are so wonderful, I marvel at your skills. the first one with all the waves/layers really looks like art that should be hung, quite beautiful. Are you planning to exhibit your textiles pieces you are currently working on? Woudl love to see them displayed if you do. Wonderful work, truly. Thank you soo much for adding them to our picnic this week. Michael, these and other pieces will be going into two different shows in June. I did not get a chance to take a photo of my recent exhibits at the gallery as the pieces were sold before I could get in to see them in situ. Both pieces are lovely. Brilliant use of the lace for the foam on the waves! They are both wonderful. I can feel the boats moving on the water. Lovely and creative. Linda, what beautiful stitching! I admire your skill-set, let alone the ability to take a piece of artwork in your mind and incorporate it into fabric. It's fabulous! If my father were still alive, he's love this! One of my fond memories of him. :) Hope you have a lovely weekend! Such lovely applique work...love the colours you chose. I enjoy being creative working in fabric, pen, acrylics, coloured pencils and markers.